We’d love your help. 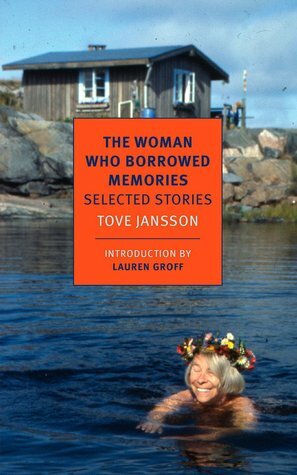 Let us know what’s wrong with this preview of The Woman Who Borrowed Memories by Tove Jansson. Tove Jansson was a master of brevity, unfolding worlds at a touch. Her art flourished in small settings, as can be seen in her bestselling novel The Summer Book and in her internationally celebrated cartoon strips and books about the Moomins. It is only natural, then, that throughout her life she turned again and again to the short story. The Woman Who Borrowed Memories is the first extensive selection of Jansson’s stories to appear in English. To ask other readers questions about The Woman Who Borrowed Memories, please sign up. It wasn't intentional, I promise. I was just waiting for a book to come in the mail. So I picked up - re-picked up - this collection of short stories thinking I could bang out a few more and then set it aside until another interlude occurred. But that same day, doing my morning ritual of breakfast-post office-used bookstore, I found Haruki Murakami's Men With Women at a shaved price. I found myself reading a couple of hers, then one of his. Couple of hers, one of his. And, well, there's no way It wasn't intentional, I promise. I was just waiting for a book to come in the mail. So I picked up - re-picked up - this collection of short stories thinking I could bang out a few more and then set it aside until another interlude occurred. But that same day, doing my morning ritual of breakfast-post office-used bookstore, I found Haruki Murakami's Men With Women at a shaved price. I found myself reading a couple of hers, then one of his. Couple of hers, one of his. And, well, there's no way around it: you do stuff like this, no matter how unintentionally or ill-equipped, and you find yourself in a wilderness of comparative study. On the printed page I saw minimalist dialogue, so I found myself folding the book to check the cover. Who was speaking: a Japanese man or a Swedish-speaking Finnish woman? When a cat appears, you think you know. But you might be wrong. "Not particularly," said Viktoria. "What I like best is New Orleans, and classic jazz. When I retired, my students gave me a stereo. I take good care of it." What I found though, is that I started reading more Jansson in between my reading of Murakami, even though I was enjoying them both. With Murakami, however enjoyable the reading, his short stories have a sameness. There's a guy, kind of a blank canvas. Some one else wants to talk to him, explaining a love that is always inchoate, unrequited, or simply failed. The guy is observant, and always polite. Invariably a writer or someone engaged in the arts. The stories end bittersweet, but the guy walks into the sunset, having learned some sad lesson. Jansson took chances. Will a gay couple break up because the one is obsessed with building a doll's house? A squirrel shows up on an island where an old woman lives alone. A popular cartoonist quits, suddenly, and a new cartoonist takes over the strip. People write letters; some are imagined. There's an after-apocalypse to rival Saramago or McCarthy. But always there's islands. And solitude. Solitary people interest me. There are so many ways of being solitary. Tove Jansson was never completely solitary. She was just picky on whom she invited to her island. Tony charged me with reading this— …de-numb the world! was his exhortation. I was a willing foot-soldier having already read two of Jansson’s works, including A Winter Book which shares a few of the same stories with this volume, “The Squirrel,” “Traveling Light,” “Correspondence,” “Messages”: they were a pleasure to read again. I started this book over the holidays—the perfect time to read short stories like these—and doled them out to myself one per evening. I could’ve rushed through the stor Tony charged me with reading this— …de-numb the world! was his exhortation. I was a willing foot-soldier having already read two of Jansson’s works, including A Winter Book which shares a few of the same stories with this volume, “The Squirrel,” “Traveling Light,” “Correspondence,” “Messages”: they were a pleasure to read again. I started this book over the holidays—the perfect time to read short stories like these—and doled them out to myself one per evening. I could’ve rushed through the stories, but most needed savoring long after I was finished reading them. Several of the stories are breathtaking and I reread passages to figure out how Jansson did what she did. Nevertheless, I still don’t know how she accomplished “The Locomotive”, about a man with murderous fantasies and an obsession of railways. Was it all fantasy? Was some of it ‘real’? I have no idea; it was that brilliant. There are other stories of obsession: in “The Doll’s House” a man’s hobby takes over the house while his partner worries about an intruder to their congenial life. Jansson’s characters are not always in a comfortable relationship, though, as another favorite theme is isolation. The aforementioned “The Squirrel” combines both obsession and isolation: the first time I read it I found it funny; this time I thought it dark. “The Cartoonist” and “Shopping” (surprisingly, a post-apocalyptic tale) contain both themes as well…and then the main characters reach out to others. As Jansson writes in “The Garden of Eden”, a story that features a surreal, though serious, knife fight: There are so many ways of being solitary. I could go on— the story about a forthright boy who rubs others the wrong way (“The Summer Child”) has also stayed with me and, oh, man, that ending of “The Gulls”—but I’ll stop here. You won’t go wrong if you read Jansson; and I will be reading even more of her. Although I find it very unusual to like every story in a book of shorts, in this one I can say I did. There was something that attracted me to each of these stories. There were of course a few standouts, one of which was titled The Squirrel. The sense of urgency, the loneliness and desperation of this woman living alone on an island and how she was so happy to see the squirrel and so desperate to have it stay. There is a twist here because I never really could figure out if the squirrel was actu Although I find it very unusual to like every story in a book of shorts, in this one I can say I did. There was something that attracted me to each of these stories. There were of course a few standouts, one of which was titled The Squirrel. The sense of urgency, the loneliness and desperation of this woman living alone on an island and how she was so happy to see the squirrel and so desperate to have it stay. There is a twist here because I never really could figure out if the squirrel was actually real or not or if it arose out of her terrible loneliness. The other story was altogether lighter and called, Traveling Light, about a man who needed to share his optimism with others. The clarity of the writing in this collection was amazing, the descriptions wonderful. Really allowed me to immerse myself in each and every one of these stories. Themes of loneliness, nature and creativity were all explored. A truly wonderful collection. Tove Jansson to me is Mommin, as she is undoubtedly is too many people. But I’ve discovered that her adult work is just as enjoyable and has a wonderful, if sometimes perverted (which makes it better) sense of humor. This is a collection of various short stories, and while I didn’t enjoy every short story it is a very good collection. My favorite is mostly likely the one that is dedicated to Edward Gorey, “Black-White”. This story, like most of the others in the collection is about creator and c Tove Jansson to me is Mommin, as she is undoubtedly is too many people. But I’ve discovered that her adult work is just as enjoyable and has a wonderful, if sometimes perverted (which makes it better) sense of humor. My favorite is mostly likely the one that is dedicated to Edward Gorey, “Black-White”. This story, like most of the others in the collection is about creator and creation. The story not only references several of Gorey’s outworks but does make a reader want to read a biography about Gorey. The idea of creation taking over the creator is most thoughtfully depicted in “The Cartoonist”, and a reader has to wonder if this is, in part, about her own success with her strips and then her brother’s taking over of such work. There are several stories about the natural world and the people that view it. There is a story of a woman and the squirrel that visits her on the woman’s island. The short story “The Doll’s House” isn’t Ibsen. That ultra-rare beast, the awful NYRB selection. And man, these are dreadful. It's surprising, though, because Jansson was the creator of the "Moomin" weirdness for kids, which I remembered tangentially encountering at some point in the early 80s, and found memorable somehow. Unfortunately, there is nothing to commend these terrible stories even to an idiotic child, or man-child for that matter. These are uninspiring, with only vague hints at captivating whimsy or weirdness. I found myself gaily That ultra-rare beast, the awful NYRB selection. Jansson's tales unspool in the strangest ways while rarely resorting to Twilight Zone twists. * Her language is usually written from a great distance. (Is there such a thing as 4th or even 5th person narration?) But they won't fail to move you. And you'll be moved often if you read them all. Readers, like you and me, have their pick of favorites. Mine was The Summer Child. I don't know why it took me so long to come across that story, to incorporate it into my own inner mythology. How have I live Jansson's tales unspool in the strangest ways while rarely resorting to Twilight Zone twists. * Her language is usually written from a great distance. (Is there such a thing as 4th or even 5th person narration?) But they won't fail to move you. And you'll be moved often if you read them all. Readers, like you and me, have their pick of favorites. Mine was The Summer Child. I don't know why it took me so long to come across that story, to incorporate it into my own inner mythology. How have I lived without it all these years? I received an ARC from The New York Review of Books through Edelweiss. This collection of short stories is divided into four sections, the first of which is entitled "The Listener" and was originally published in 1971. I found the stories in this part of the collection to have a dream-like, almost surreal quality to them. In the story that is the title to the collection, "The Listener", a woman who is called Aunt Gerda has always been a great listener to her family. She listens intently to all of I received an ARC from The New York Review of Books through Edelweiss. This collection of short stories is divided into four sections, the first of which is entitled "The Listener" and was originally published in 1971. I found the stories in this part of the collection to have a dream-like, almost surreal quality to them. In the story that is the title to the collection, "The Listener", a woman who is called Aunt Gerda has always been a great listener to her family. She listens intently to all of their stories and woes and when she is about fifty-five years old her personality starts to change. She seems to forget names and people and starts to spend a lot of time by herself. Aunt Gerda begins one day to map out, in great detail, a family tree and all of the relationship dynamics within the family. Then she includes on her map, through a code of colors, all of the secrets that various family members have told her over the years. I found this story, and the others in the first part of the collection, to take a surprising twist. This is not a sad tale about a woman who is in the early signs of Alzheimer's but instead it shows that buried somewhere deep inside her sub conscience are all of the stories which family members have confided to Aunt Gerda over the years. These stories have become a part of who she is. One of my other favorite stories in the collection is entitled "A Leading Role." A woman named Maria has been giving the leading role in a play which is her first big part in her theater career. But Maria doesn't like the part she is given because she believes that the middle-aged woman she is required to play is "insignificant and anxious" and completely devoid of any personality. One weekend Maria is at her lake house and is terribly bored due to a lack of company. She decides it would be a great idea to invite her cousin Frida to spend some time with her because Frida has the same personality traits of the role she is to play in her major theater debut. When Frida visits she is nervous, soft-spoken and plain. Over the course of several conversations Maria completely changes her opinion of Frida and as a result begins to embrace her new part in the play. This story reminds us that a book cannot be judged by it's cover and we never truly know a person unless we spend some time engaging them in meaningful conversations. Overall, I thought this was a remarkable translation of Jannson's works and it is unfortunate that they have not been translated into English until now. The New York Review of Books has published yet another wonderful collection of interesting stories. A wonderful book to dip in and out of, pick up and put down. Tove Jansson always seems to capture the 'quiet' moments of life that aren't actually quiet at all. There's no strong driving plot but astute observation & interpretation of people and the world. Tove Jansson has come to be one of my most beloved writers. She creates these insanely sinister worlds with so little cheer that it sends shivers down your spine as you read through the pages. She sees so much and is then able to articulate it so well that the emotions transcend the process of translation and come straight to you. There is immense loneliness in her writing, and a severe recognition that despite any relations you may have, your world is still your own. The inability to share it w Tove Jansson has come to be one of my most beloved writers. She creates these insanely sinister worlds with so little cheer that it sends shivers down your spine as you read through the pages. She sees so much and is then able to articulate it so well that the emotions transcend the process of translation and come straight to you. There is immense loneliness in her writing, and a severe recognition that despite any relations you may have, your world is still your own. The inability to share it with someone else is the cost at which independence comes. While my favourite book from her is still The True Deceiver, this collection comes a close second, as there are very few stories where the deceit or darkness of the earlier favourite doesn't show itself. Like most short story collections, there was some unevenness. Some stories were excellent, some mediocre. But even a mediocre story by Jansson is better than most short stories I've read. She tackles the topics of loneliness, aging, relatives, anxiety, passion, and obsession with such originality. While I liked her Summer Book much more, this was still worth reading. I can tell these are quality stories but I didn't really feel connected to any of them. I will say that Jansson knows how to do creeping weird. Favorite stories from the collection: Black-White, The Squirrel, The Doll's House, A Leading Roll, White Lady, The Summer Child, Traveling Light, and The Garden of Eden. So good! her sensibility is not for everyone, she sees a world of sinister developments hiding behind the humdrum. (Her children's books are the opposite -- seemingly sinister events turn out to have friendly, family-ish meanings). Anyway, I loved it. I read about 8 of the short stories and that was enough. All disturbing and not in a good way. I rarely quit reading a book once I start but this will have to go in that pile unfortunately. I'd sworn not to give anymore stars to anyone (doesn't seem fair somehow), but this book is worth it. A mixed bag containing a few gem-like stories that illuminate a particular point, and many stories that mystified me as to why they needed to be written. Too subtle for a lunkhead like me? Perhaps. Rarely has the short story form been so thoroughly mastered. Jansson is something else. Beautiful anguish and art and birds. When I think of writers who have mastered the art of capturing light and optical phenomena in general, there are two names that spring to my mind: Vladimir Nabokov and Tove Jansson. My job is to paint with light, that’s all that is. The right light at the right time, writes Jansson in a short story called The Garden of Eden. And in most of the stories included in The Woman Who Borrowed Memories, a collection including short fiction selected from five of her books published between 1971-1998, she When I think of writers who have mastered the art of capturing light and optical phenomena in general, there are two names that spring to my mind: Vladimir Nabokov and Tove Jansson. My job is to paint with light, that’s all that is. The right light at the right time, writes Jansson in a short story called The Garden of Eden. And in most of the stories included in The Woman Who Borrowed Memories, a collection including short fiction selected from five of her books published between 1971-1998, she shows exactly what the right light at the right time entails. For what binds these short stories, besides their recurring themes and concerns – art, loneliness, travel, the terror and wonder emerging when humans engage with the natural world – is an impressive interplay between light and shadows, light and darkness, literally and metaphorically. She continuously captures a world in which there’s deep desolation, an icy, unnamed danger. Terror. Isolation. Even madness. Yet just as the secluded artist in her Black-White story, she cuts across all that with narrow and dangerous shafts of light, creating a variety of effects with the same light brush: splendour, wonder, piercing clarity, warmth, mystery. As is the case for the entirety of her art, these short stories are deceptively minimalistic, smooth like a pebble polished by the sea. Sometimes intimidatingly closed. The experience of reading them feels similar to that of enjoying candies coated in cocoa powder. At first, the taste seems strong and bittersweet, even a bit dry. A tune in two notes. The more attention you give them though, the more notes become crisp and clear, and a rich, velvety core that lingers for a long time is uncovered. They are intricate and layered stories but Tove Jansson always hides that complexity gracefully, under an unobtrusive, simple-seeming veil. Some of these short stories were like eating a chunk of good chocolate, left you really wanting more. I really enjoyed the ones in particular set in her native Finland, often on small islands. The isolation, the weather, the introspection. One story about a burnt out newspaper comic strip writer is surely at least semi-autobiographical. I'm glad she moved on from the Moomins, her adult writing is far superior. I've read a few of Jansson's translated story collections, but if someone asked me where to start with her short fiction, I would point them here. The titular story was worth the read alone--I found it genuinely disturbing, and the fact that Jansson (and her translator) pulled it off in just a handful of pages is remarkable. 3.5. I read the first story and thought: Oh My God! I'm about to be INFLUENCED! A terrifying thought. I should be unafraid of influences at this point in my life, and in fact by the second story I was already abandoning my fears. Yes, she's an impressive writer, but as I went on I found the claustrophobia too restrictive, the intensity of the narrowness not at all my ongoing ice cream. I've very much enjoyed her writing, it's well done, but often rather dark, so there is that, if you are not feeling like depression. Intelligent and perceptive though. Tove Jansson wrote and illustrated her first Moomin Tove Jansson was born and died in Helsinki, Finland. As a Finnish citizen whose mother tongue was Swedish, she was part of the Swedish-speaking Finns minority. Thus, all her books were originally written in Swedish.